After the Ruins, 1906 and 2006. 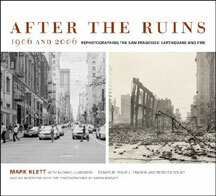 Rephotographing the San Francisco Earthquake and Fire. Photographs by Mark Klett. With Michael Lundgren. Essays by Philip L. Fradkin and Rebecca Solnit. Interview with photographer and Karin Breuer. University Of California Press, Berkeley, USA, 2006. 140 pp., 52 color and 56 duotone illustrations, 2 maps, 2 double gatefolds, 11x10".